DANVERS, Mass.--(BUSINESS WIRE)--Abiomed (NASDAQ:ABMD) has achieved CE Mark for Impella Connect, the first-of-its kind cloud-based technology that enables secure, real-time, remote viewing of the Impella console for physicians and hospital staff from anywhere with Internet connectivity. European CE Mark adds to Impella Connect’s previous U.S. FDA PMA approval. Impella Connect uses real-time intelligence to help improve patient outcomes. 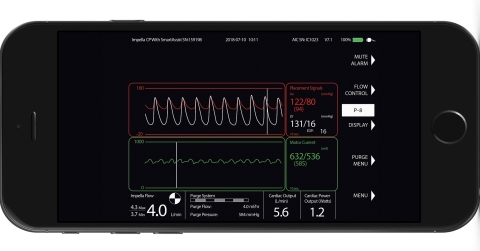 In addition to allowing medical professionals to view their hospital’s consoles remotely, Impella Connect allows highly-trained staff at Abiomed’s 24x7 Clinical Support Center to provide medical professionals with expert evaluation of Impella data and real-time collaborative patient management. “Impella Connect is an extremely valuable resource that allows me, as well as allied health professionals and nursing staff, to have direct visualization of data from the Impella console and to closely monitor patients on hemodynamic support, in real time,” said Rajeev L. Narayan, MD, Assistant Director of Structural Heart Intervention and Director Interventional Mechanical Circulatory Support, Vassar Brothers Medical Center. Based on the previous FDA PMA approval, Impella Connect, which is fully HIPAA compliant, is in a limited market release in the United States. 36 hospital sites are currently using the technology on a regular basis to provide enhanced real-time support for their patients. Abiomed will launch Impella Connect in Europe this quarter through a controlled roll-out at hospital sites with established heart recovery protocols. The first hospital will be University Heart Center in Hamburg, Germany. Abiomed has achieved CE Mark for Impella Connect. European CE Mark adds to Impella Connect’s previous U.S. FDA PMA approval.